A very small list for sure, but did pretty well all things considered. I went 1 and 1. I beat the Space Marine player, and lost to the Orc player. Now, to be fair, the Orc and Tyranid players both brought 2 lists, one anti-horde and the other anti-SM. Both myself and the SM player bought one list, and after the tourney, we explained that next time, it's one list for everyone. The terrain was heavy city terrain on a 4x4 table. Both rounds were also Dawn of War for everyone due to randomness being consistent. I played two objective games. against the SM, the critical part was deploying first and strategically. The SM player deployed far back in a building. This proved to be a problem as it hindered his mobility. My DP took out his HQ a 5-man tac. squad, and being able to fly around was great for mobility. He was able to jump up and assault the HQ and squad on round two. strategic placement of troops also allowed them to stay close to objectives without getting fired at. The Dreadnought didn't do too much, other then a bit of damag to a Sternguard unit. But he was a big deterrent from the SM's leaving their building without him going down. The orcs consisted of 1 Copta, and 2 squads of boys, nobs, and that HQ that gives the squad Feel No Pain. In the end, it was just numbers that killed me. A minor part of forgetting the objective of the game (objectives, not killing!). However, this list was custom designed to kill SM's, so I'm not worried too much. Even still, the first 3 turns looked like it was in my favor. However, when my 5 man CSM squad died all in one shot by failing all 5 of their armor saves, it was clear that the chaos gods were not in my favor. All in all, a good night of gaming. We'd have pictures, but frankly, I didn't get many. The "recharged according to my wife" camera was low on batteries. Awesome! After the games, we went across the street for beer and burgers, and a good time all around. So, tonight I applied Vomit Brown over the Tausept Ochre base. Tomorrow I plan on doing the arms and weapons with both the base and the second layer. I'm also going to figure out what I want to apply as the liner. That will hopefully be the next step. Once that's done, we can get to detailing! As far as the miniatures are going, they are turning out really well and I'm very happy with them so far. I can't wait to see them done! So, this Saturday, three friends and I are meeting up to do a little mini tournament. Our goal is to play several 500 pt games that evening. Force Composition is restricted to 1 HQ, 2+ Troop choices, and 1 Heavy, Elite, or Fast Attack choice (that is 1 of them, not one each). The attempt here is troop heavy combat that are fighting in city terrain. 500 points isn't much to work with, so I'm going for quantity. These are my front line troops. Their the assault types, and what I plan on using as front line fighters. Pretty simple here. Flamers are picked because we are using city terrain, and 2 out of the 3 armies I'll be facing are horde (Orc and Tyranid), so will be using cover. This is my ranged/tank killer choice. At this point level, I don't imagine I'll be seeing much armor, but I'd rather have it just in case. Besides, it's instant death to anything it hits. This was a difficult choice, in truth. He's in here because of the mobility he offers, as well as the insane power he provides. 5 attacks on an assault, Warptime, and MC weapons: he's my my killer unit. His job is to get in and destroy the opposing "big scary unit" that I'm bound to face. The prize for winning is pretty big: free dinner later that night! This is the Fire Warrior squad after one coat of Tausept Ochre. Ensuring the lines were as straight as possible was time consuming, but well worth the effort in the end. Already the squad looks impressive on the table even without arms. The next steps is to do all the arms and the weapons with the same color. After that I start applying Vomit Brown to the Tausept Ochre areas, though this should go quicker. Finally, I have edging to do, though I have though about the mix I'll use for that. After all the armor is done, I'll line the cloth areas, which will most likely remain black to match with the lining color. After all the cloth and armor have been lined, I'll add the arms and weapons. From there, we work on detailing, and then finishing up the bases. I finally started working on my Tau army. I love Tau. The models are beautiful and sharp. The story is awesome. The playstyle seems fun. It's completely different from my Nurgle army (which I still love!). Tau are the opposite of Chaos Space Marines in terms of fluff and style. I finished modeling the Stormlord, and I wanted to take a break. I'm waiting for some Ebay stuff to come in so I can continue working on the Plague Tower, and so I decided I'd paint up a Fire Warrior squad. The goal with this army is simple: create an awesome looking army that I can pull out and get people to stare. Every model in this unit tells a specific story. Really! Every model is posed in a certain way and for a reason. I went through each model and posed him with a purpose. I based everything before I started modeling. 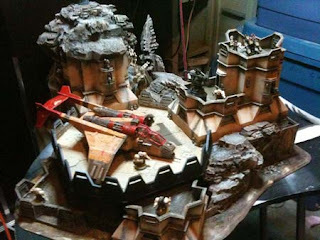 This ensure that the models were setup around the base. Some of the Fire Warriors are walking around rocks on the ground, others are using it to brace themselves as they fire, and finally some are still running into position. I'm going for the traditional Tau Sept color look (Vomit Brown). I debated going for a simple white them, or some other them, but in the end, I wanted Vomit Brown. So the Fire Warriors are getting built first. I'm still on the bench as far as drones go. I'm not sure how I will use them in the army (though i will use them), so I havent' bothered with them in this unit yet. After they are finished, I start work on my first Devilfish. The Fish will be completley magnetized. The doors will open, the inside will be painted. Seriously, I want this army to look nice. Considering I already have a fully working Nurgle army painted up, I'm not in any rush to get these guys done fast. Anyways, I've already started painting them. I'll keep you updated! I'll be honest, hearing Dark Sun is coming in 2010 makes me very happy. 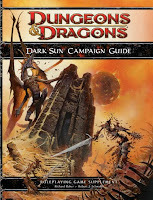 When 4E came out, Dark Sun was the one setting I was really hoping they would bring back. It fits with the feel 4E has going for it so well. My only complaint? Waiting until 2010 to get it, and even then, it won't be till the middle of the year. Our goal with the setting was to cleave as close to the original boxed set as possible while still allowing as many D&D options as we could and making the setting ideal for 4th Edition play. This is nice to hear as well. The original setting before any story elements were developed is the preferred setting of many. It's good to know that they aren't fast forwarding anything and working to keep it how everyone loved it. Created by popular demand, this requested setting was saved specifically for now in 4th Edition, and will also feature new novels set in the world of Athas. That is also very true. Fans have been proclaiming loudly for a while now that 2010 was the year of Dark Sun, and I'm glad WotC listened. Saw this wonderful fortress setup here and wanted to share it with you, whoever you might be. He posted a lot of pictures of the build. Maybe later one when I've completed a few of my other projects I'll get to building something like this. The big problem I have with Chaos is a problem I have with the way I build armies. I look at things in a "how would it really be" sort of way. I like the story behind an army. I like to have a leader. When my Daemon Prince died to a swarm of rending genestealers, he suffered by not being invited to the next game. After all, he had failed me. But the other problem is my Nurgle army. Plague Marines are awesome, but they are one sided. Plague Marines have 3 weapon choices (Flamers, Plasma, and Melta), which are all good choices for whatever you intend the unit to do. You also only need 5 marines to get two of those weapons. But that's all you can really do outside of the Champion options. This can get bland quick. The new Chaos Space Marines are all about mix-and-match units from different gods. But here's the thing I have to remember: Just because Emperor's Children are pretty in pink and don't worship Nurgle doesn't mean you can't still include them in a Nurgle force. Indeed, you can just as easily paint them up in Nurgle colors, come up with some other story or a different themed weapon using the same stats, and suddenly the Emperor's Children become Emperor's Bile, a unit for long ranged combat as well as better horde killing abilities. Khorne Berzerker's don't need to worship the Blood God in your army. They don't even have to be Khrone Berzerker models. Have fun with the Nurgle Plaguebearers from the Daemon army. Suddenly your Nurgle themed army have a hard hitting close combat unit. The key here is consistancy within your theme. If you want a multi-colored army, by all means, go for it. I know I wanted to paint up Emperor's Children as the Pretty Pink Pwnies, and even give them a Rhino in pink just to shake things up. But I want to see what I can do about creating a Plague Sons (Thousand Sons) unit. The other thing to remember for your Chaos Space Marine army is that you don't necessarily need to buy the coresponding model. Sure, you might actually like the look of Thousand Sons, but you can just as easily use normal chaos marines. I've seriously considered rewriting the CSM Codex for my own purposes and put a Nurgle slant on everything. That way, instead of taking Khorne Berzerkers, I'm taking my Daemonic Plaguebearers. Instead of Emperor's Children, I'm taking Plague Bringers. Even give vehicles different names based on different options. After all, a Predator with a Twin-Linked Lascannon isn't as interesting as Nurgle Plaguecannon, and a Vindcator is a Thundering Bilecannon.